With some of the best service in the league, SKC, like the Galaxy last week, pose a significant threat to Portland’s weak spot. The Portland Timbers stood toe-to-toe in a dramatic draw with the defending champs on Sunday, in front of a raucous sold-out Providence Park crowd and a national TV audience. In a series that always seems to produce classic games, the Timbers and L.A. Galaxy first traded punches, then haymakers. Fifteen minutes before halftime, Darlington Nagbe’s sick backheel sprung Rodney Wallace, who played Fanendo Adi into perfect position to curl a shot past Brian Rowe, opening Portland’s home scoring account. Gyasi Zardes then rammed home a pinpoint Jose Villarreal cross 20 minutes into the second half, to knot the game at 1. Adi’s second goal of the day appeared to be the knockout blow that would propel the upstart challenger to victory. Through clouds of green smoke and spring mist, just past the essence of gasoline and sawdust, you could taste the points. In a flash, victory was reduced to draw. Alan Gordon, yet another in the long line of former Timbers who return to the Rose City to haunt the home team, rudely interrupted the Timbers Army’s celebration by looping in an equalizing header deep into stoppage time. The former USL Timber has a knack for late goals; the MLS Timbers, no matter who’s coaching or playing, have one for conceding on set pieces. Frustrated as Caleb Porter must be with drawing the two opening games at home, the quality of opponents have been high. Sporting Kansas City, who also opened their schedule with at home, kicked off the season with a 1-1 draw against the turmoil-laden, post-Thierry Henry Red Bulls. They were then welcomed back to the Western Conference with a 3-1 thrashing at FC Dallas. Two expected playoff teams are in search of rhythm, and a good result. 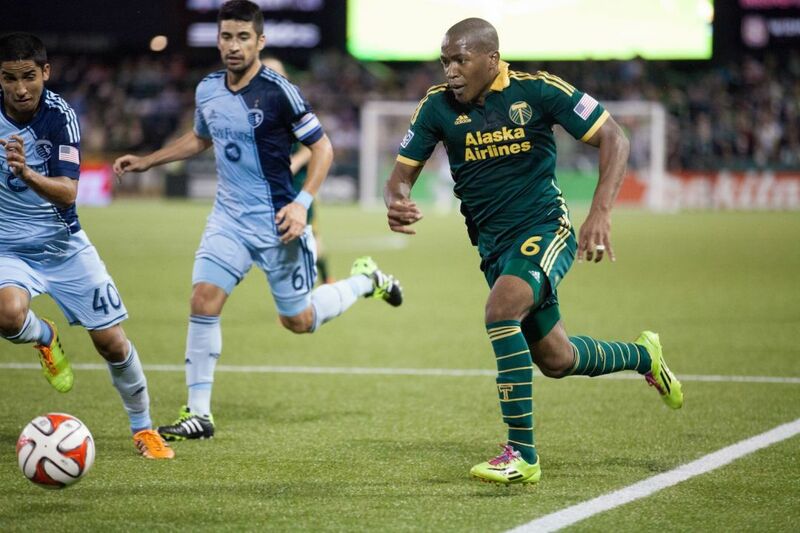 The Timbers enjoyed success on the road in 2014, and were one of only three teams with a positive road goal differential. This match marks the midpoint in a rough six-match season-opening stretch, and the first of two back-to-back on the road. Sporting head coach Peter Vermes plays a 4-3-3, and his lineup is littered with recognizable names. USMNT midfielder Graham Zusi plays up front along charismatic forward, Dom Dwyer (Mr. Sydney Leroux!) and newly-signed Hungarian international, Krisztian Nemeth. The center of midfield features USMNT regular Benny Feilhaber, one of the better distributors in the league. On the wings, Vermes usually uses Paulo Nagamura on the left and Roger Espinoza, back from his stint with English Championship side Wigan Athletic (Ridgewell’s loan team,) on the right. In all Sporting boasts one of the league’s best, most well rounded front sixes. With some of the best service in the league, SKC, like the Galaxy last week, pose a significant threat to Portland’s weak spot. In order to leave Sporting Park with points, the Timbers will need to tighten up on crosses and set piece defending. One familiar face that won’t be around for SKC is defender Aurélien Collin; he and his red cards were traded to Orlando City in the offseason.While the Timbers are relatively settled with their back line, Sporting are holding open auditions. Ike Opara, who missed most of 2014 with achondral defect injury in his right ankle, has started both matches so far in central defense, and will likely like up alongside Matt Besler. UPDATE: As of Friday morning, Opara is listed a questionable with a sprained left shoulder, which means SKC might hand a start to 17-year old homegrown defender, Erik Palmer-Brown. Already six defenders have played 90 or more minutes for coach Vermes, with unlikely first round draft pick, Amadou “T” Dia, filling the right back role vacated by the injured Chance Myers. He starts opposite Canadian international, Marcel de Jong. The result? Sporting have conceded four goals in two matches, and that bodes well for Portland. 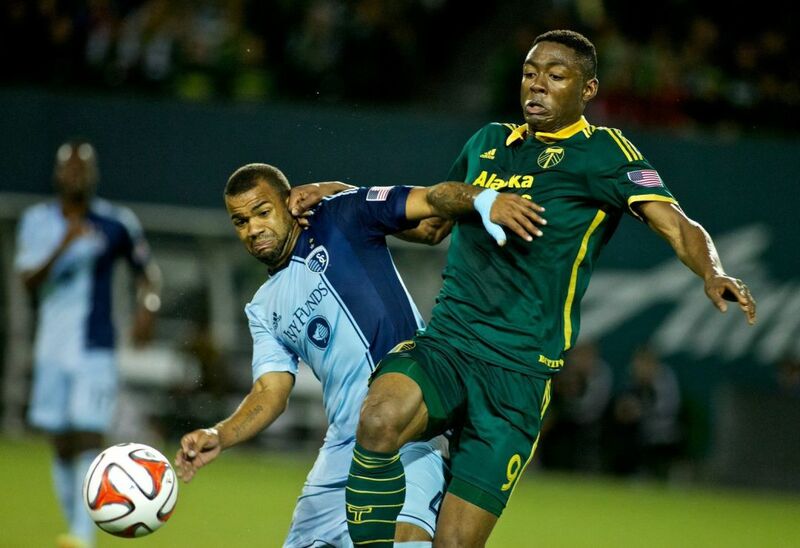 As last week’s match showed, the Timbers’ offense is sputtering to life. While one player scored both goals, the buildup to Fanendo Adi’s strikes were perfect examples of Caleb Porter’s style of play. One person ultimately needs to score, but the goals were team efforts that began in the defensive half. Even Adi’s missed first opportunity displayed what the Timbers midfield is capable of. Darlington Nagbe’s lackluster 2014 seems to be well behind him, and the talented midfielder has so far displayed the skill and aggression everyone has been waiting for. A vulnerable SKC defense could provide the perfect platform for Nagbe’s first goal of the season. Rarely do we spotlight the central referee prior to a match, but this game’s assignment brings an added quirk: Silviu Petrescu will be refereeing for the first time since being suspended by PRO Referees for repeated missed calls in the Philadelphia Union/Colorado Rapids game on opening weekend. If the Timbers keep up the attacking flair shown in the two games at Providence Park, there will be plenty of chances and, ultimately, hopefully, goals. The key is keeping them out at the other end.